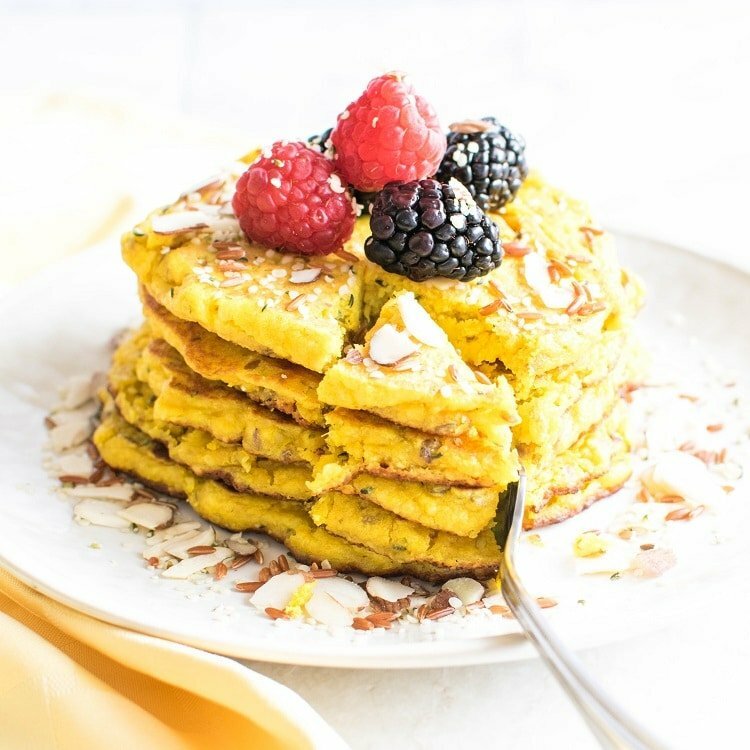 Anti-Inflammatory Vegan Turmeric Pancakes are soft, fluffy, easy and delicious breakfast option with earthy flavors. It’s a great post-partum food. These pancakes are great for lactating moms as well. If you have followed my previous couple of posts I have been talking about my recent pregnancy experiences and endeavors on eating healthy along with trying to be on schedule. These pancakes are one of my creations for the post-partum times. Healthy recovery and ability to nurse y the baby is one the priorities for all the moms and so is mine. Since, I am been experiencing some highs and lows during this time period my feeding ability also fluctuates with the circumstances. Extremely long working hours and prolonged sleepless nights sometimes hinders the recovery and the milk flow. 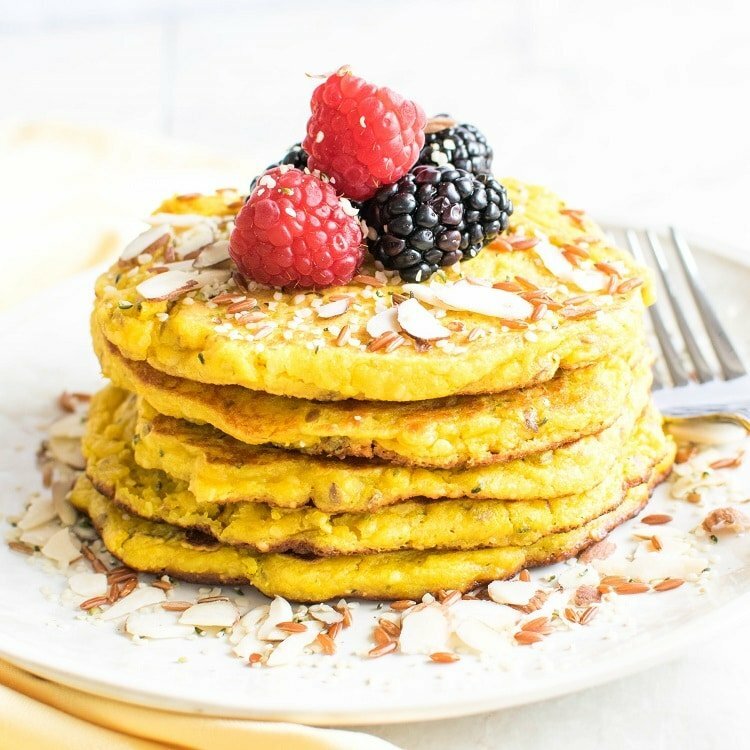 These Anti – Inflammatory Vegan Turmeric Pancakes are great to maintain the continuous flow of breast milk and helps in healing as well. It’s a wholesome and nutritious breakfast along with being protein rich. I love the fact that these pancakes are make – ahead and stores in the refrigerator for 4-5 days. It’s definitely a savior. These days, I mostly, aim to cook over the weekend for at least 3-4 days in advance especially breakfast. Even though I usually bank on smoothies but sometimes I crave for some warm, delicious and satisfying breakfast after having a crazy busy night with my 3 ½ month old. Almond flour – is rich in fiber and protein along with being a good source of vitamin E.
Chickpea flour – Improves heart health and is rich in protein. It stabilizes blood sugar, lowers inflammation and improves immune function. Hemp seeds – It’s a superfood with being high in protein and fiber. Flax seeds- are a great source of omega-3 fatty acids. Banana – is high in potassium and rich in fiber. It also helps to stabilize high blood pressure. Turmeric root – has medicinal properties and helps in healing. It improves the liver function and is loaded with anti-inflammatory properties. Almond milk – is rich in calcium and is low in calories. It prevents the rise in blood sugar and reduces the risk of heart diseases. 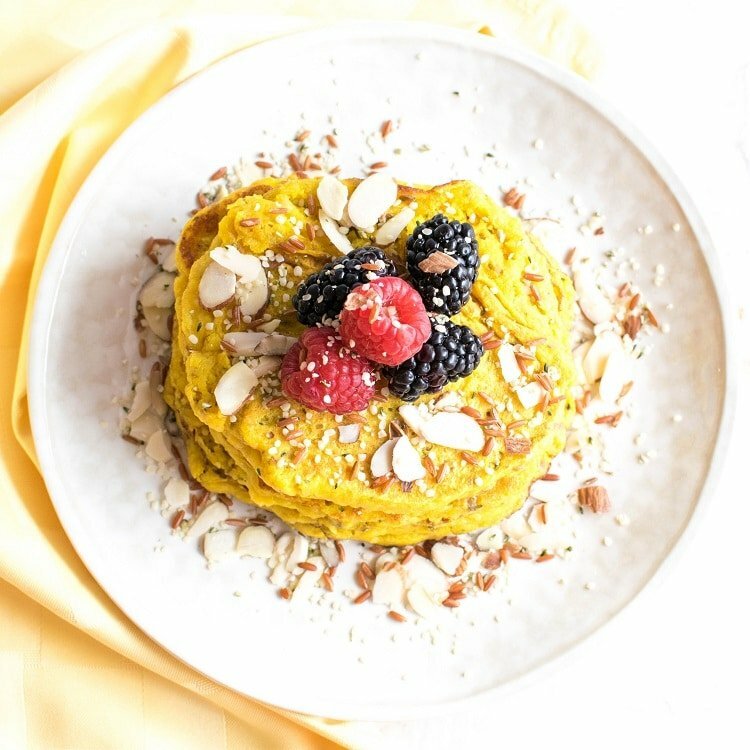 Hence, these Anti -Inflammatory Vegan Turmeric Pancakes are loaded with health and are perfect for new moms. However, the entire family can enjoy these healthy and nutritious pancakes. To make it kids friendly just pour little extra syrup over them to dilute the earthy flavor of root turmeric. 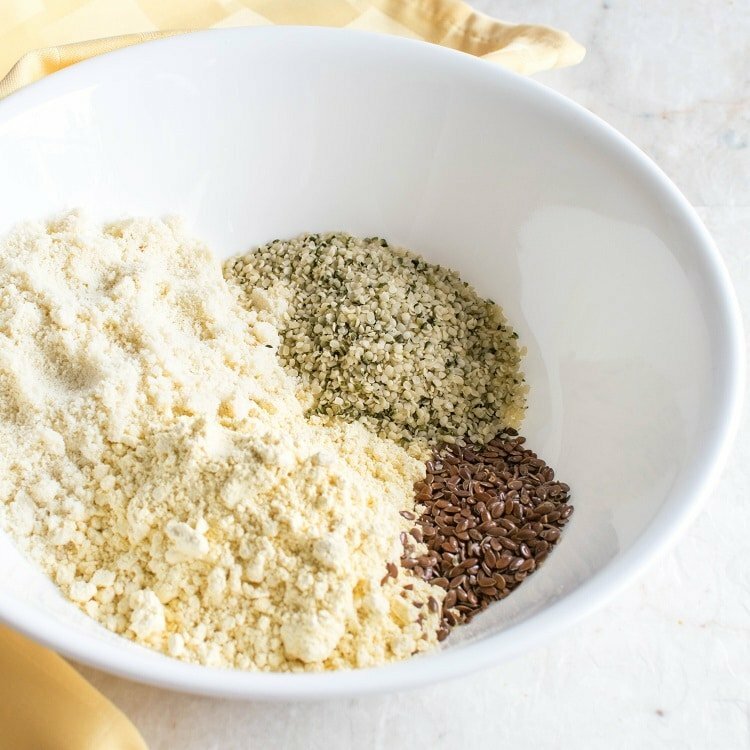 In a mixing bowl combine almond flour, chickpea flour, baking powder, salt, hemp seeds, flax seeds and mix thoroughly with a spoon. 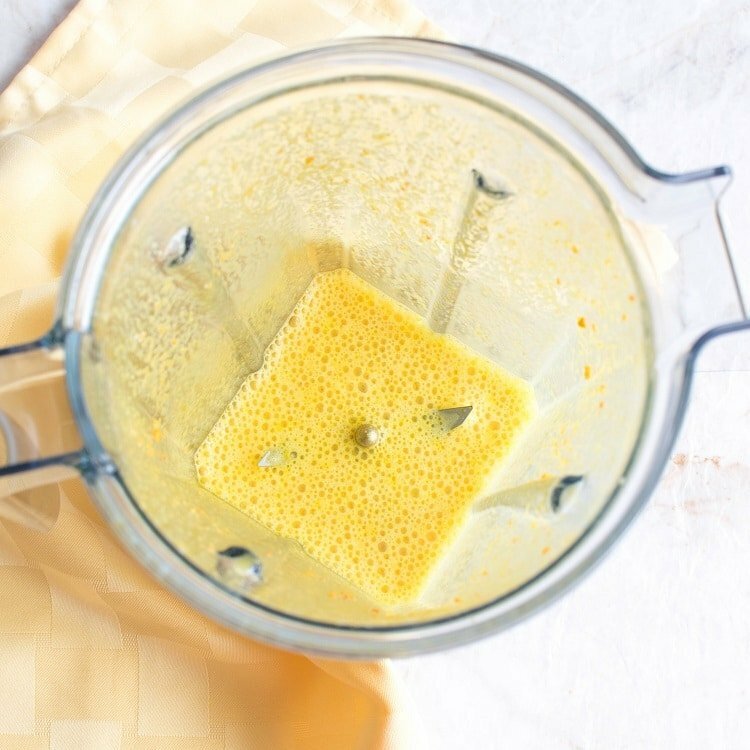 In a blender combine turmeric root and vanilla almond milk and blend it smooth. Now pour the blended turmeric and mashed banana into the dry ingredients and whip the batter nicely. Now, warm the griddle or crepe pan and grease it. Pour 2 tbsp. or ¼ cup of the batter onto the warm pan and spread it gently in a round shape. Let it cook until golden in color and gently with the help of a flat spatula flip to the other side. Let it cook again until light golden and take it out of the pan. The pancake with be very soft, like a cake. However, as it reaches the room temperature it will become firmer. Top it with fruits, nuts and seeds of your choice and enjoy. These pancakes have a rustic and strong flavor of turmeric and chickpea flour. These are very different than the regular pancakes. These pancakes are very nutritious and guilt free. If you are on a low/no sugar diet then 2 bananas would suffice as sweetener. Or else you may drizzle your choice of syrup (preferably maple syrup) to make it taste very close to regular pancakes. If you are on a low sugar/no sugar diet then 2 bananas would be sufficient to sweeten these pancakes. Feel free to drizzle maple syrup over these pancake as per your taste. These pancakes can be refrigerated in an air tight container for 4-5 days. This recipe makes 6 pancakes and the serving size is 1 pancake per person. I have been looking for some new ways to use (and eat) some more turmeric! Thank you for sharing these, definitely saving and trying! My pleasure Amanda. Turmeric is definitely one of the food item that needs to be incorporated more into our diet. I’ll definitely be saving this recipe. I’ve been looking for healthy and vegan friendly alternatives to my favorite foods. Thank you Cyndi for stopping by. I hope your family enjoy these pancakes. I have been looking for some new anti-inflammatory recipes! This sounds great! I’ve heard so many great things about turmeric but haven’t ever used it. These pancakes look and sound delicious, so maybe I finally need to give it a try! Then you must try turmeric. It is beneficial to health. These look so delicious! I never would have thought of this combination but I love finding recipes that can work for all my food allergies. Yum! Thank you Tessa. Hope you enjoy these pancakes. Ooo I love this recipe!! Such a fantastic way to get your turmeric fix in early in the day! Thanks for sharing! This is such an interesting recipe – I’ve never heard of turmeric in pancakes! I use it to make vegan scrambled eggs (with tofu) and like the flavor. I’m going to try these pancakes – thank you! Awesome! I love this idea! I’ll be making these soon! I’ve been on the hunt for a pancake recipe that uses almond milk – sounds delicious! 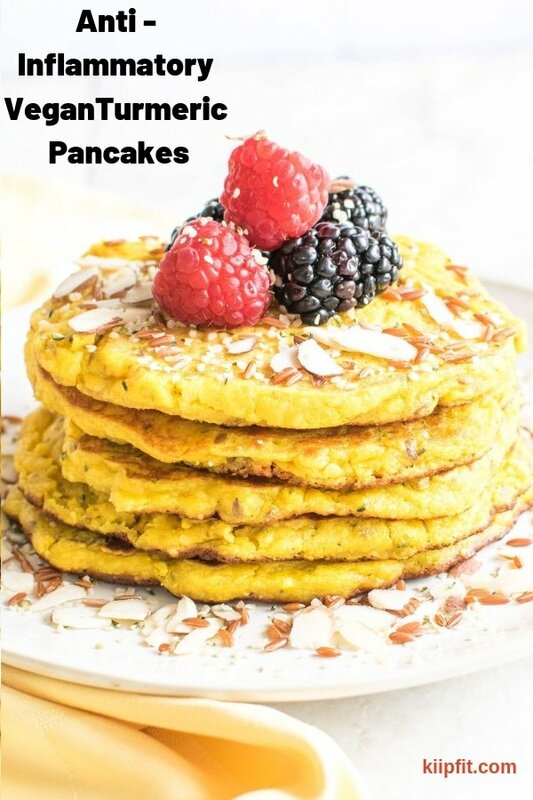 I love adding turmeric into foods, but never thought of adding it to pancakes! Awesome idea!